After a quiet sea-crossing, that has been done to us short, we disembark at the port of Tunis. Throughout the journey we have been exchanging information, maps and laughter with the rest of participants. The border crossing is incredibly agile (already they were waiting for us... so glad! ). We have made the descent by motorway each to our air, We have preferred to take it easy and have stopped eating fish and chips in a fantastic and very cheap place. In the evening we arrived at the hotel in Matmata, we already started to notice the adrenaline in the great adventure that starts tomorrow! As we approached our turn in checks, excitement and nervousness is growing: many of us will not stick eye tonight thinking about what awaits us tomorrow. All teams spend the checks without any problem and deliver empty fuel drums to the organization that will take over the fuel issue during all stages. The truth is that it is a tremendous comfort to not have to worry about refueling throughout this adventure . 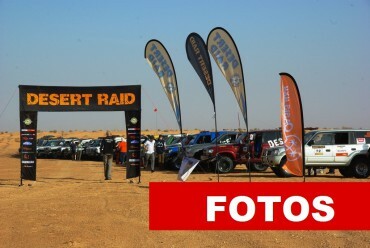 Anyway, We are already here and now yes: Starts Desert Raid 2012!! At the output of the 1st stage jitters most participants breathe, Extreme both the mode and the Adventure, because this stage means the first contact with the sand. The stage starts with a complicated step and here come the first doubts about the way forward, after some initial hesitation, We all found the passage and reached the first dunes, which are small and traps, and form a fun maze where we begin to implement our skills. Later we enter an area of ​​guidance, where the navigation to find the access point to the following sand dunes is extremely important. Cords of impressive dunes where we begin to gain altitude to reach the goal, located in Smelghea. There awaits us camp with a deserved shower, and a good dinner we shared the adventures of all partners. Home of the Marathon stage, which lasts two days: Sunrise and excitement begins: today we cross the "great wall", a great line of dunes with impossible slopes. Challenged, begin to form the first alliances, and gradually, all teams go through the dunes, some more than others easy steps. Across ahead valleys and cords more affordable: spent by Mida and continue south-west towards the reched. At dusk camped in a stunning setting, surrounded by large sand dunes, gradually they arrive participants in both categories and end the bivouac is one big party. It is a very special night because we camp for free under the stars. Sunrise and gradually abandoning the teams will makeshift camp, we expect another exciting stage arena, blade and winch. The navigation has become essential to find the entrances and passages between sand dunes really high. We have before us a difficult and demanding stage that will make the most. And at night, We cobijaremos in comfortable tents camp organized, after a hot shower and a good dinner. Sunrise at the camp and all smiles. Despite the hardness of the test, we've got the hang of the dunes and we feel very fortunate to be here. Today will circulate a stage of great beauty, it crosses an area largely unexplored, with infinite strings. This is a short stage but very technical and intense, ending afternoon. A sunset, Organization surprises us with special very funny skill tests, to the delight of all participants. The night is a succession of smiles, jokes and great atmosphere!. The last stage begins, combining areas orientation, dunes and several treacherous "Chots" ... the excitement is guaranteed, because in today's stage the winner of this edition will be decided: There are several teams in head first place is hotly contested! Participants in category ADVENTURE lucky enough to cross an area full of desert roses and stopping to pick up some. Little by little we are nearing the end of step, where we expect a comfortable. A joy and satisfaction for all experienced and forever with us, joins the sadness because it ends ... and still take a year for the next edition! Dinner is a non-stop adventure, anecdotes and laughter. Everyone has a smile from ear to ear. Tomorrow will be a day of sightseeing and relax, in which we have to head north to Hammamet, where we spend our last night in Tunisia and celebrate the awards ceremony. We use own and third party cookies to improve the browsing experience, and provide content and advertising interest. By continuing navigation we understand that our policy is accepted cookies. Accept You can get more information, or how to change the settings, this link.